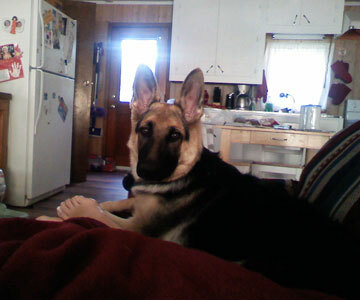 This is my female German Shepherd. Her name is Callie Renae Pate. She loves her daddy and honestly thinks she is human. Her personality is priceless and if she could I believe she would replace me so she could sleep next to her daddy every nite! She weighs around 95lbs and has a Great Dane brother who is quickly catching her in size…. Callie is beautiful and I bet she is bossy too! Your girl looks like my Mia. They are wonderful and so protective. I know you must have lots of fun with her, as we do with Mia. Callie looks so loving, take care of her and she will take care of you! Your pictures are beautiful. 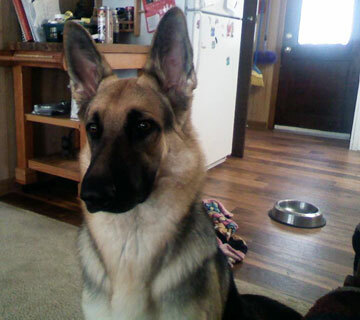 We also have a German Shepherd. Her name is Chloe, and, she is 7mos. old. Thank you for sharing.